The NASCAR Camping World Truck Series rolls into Homestead-Miami Speedway this week for the season finale Ford EcoBoost 200 and a familiar face will be behind the wheel. 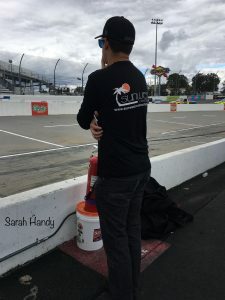 NASCAR Camping World Truck Series driver, Robby Lyons will be back behind the wheel of the No. 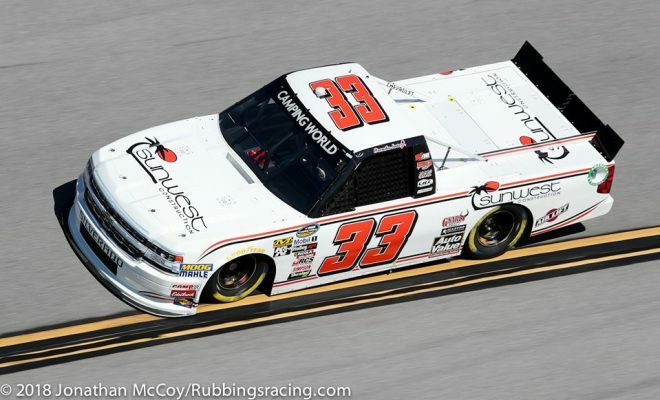 33 with new partners B&W Structural coming on board the Reaume Brothers Racing Chevy Silverado. Lyons who last raced for RBR in the Fr8Auctions 250 at Talladega Superspeedway in October will look to have another solid finish after finishing 14th in that event. This Friday’s race at 1.5-mile track will mark Lyons second career start at Homestead. Last November, after starting 20th and finishing 12th in his NCWTS debut last season at Phoenix in the No. 49 Sunwest Construction Chevrolet for Premium Motorsports Lyons was approved for all of NASCAR’s 1.5-mile tracks. This in turn led to a second race with Premium in the truck series season finale. Lyons back in the No. 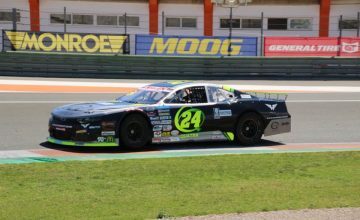 49 Sunwest Construction Chevrolet for Premium crossed the checkers with a 24th place result after starting the race in 23rd. 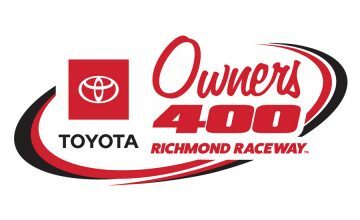 A finish with which Lyons will look to improve upon this Friday evening when the green flag drops for the final time in the NCWTS this season. I recently asked Lyons what the most challenging thing about racing at Homestead is, here is what he had to say. “I don’t have as much experience at Homestead as a lot of other drivers do but being that it’s going to be the first race track that I’m coming back to I think I can call myself somewhat experienced. I think the fact that we only race here once a year makes it a challenge. The surface is a lot like the old Darlington and your tires lose grip literally as soon as you roll off pit road. Factor that in and eventually you’re going to have to move your line up, not many drivers can make the bottom work at Homestead in a truck. I went on to ask Lyons how excited he is to be back behind the wheel this weekend. Lyons also elaborated on his team and the truck he’s running this Friday evening. In 8 NCWTS starts this season the 29-year old has two top-15 finishes, 3 top-20’s and hasn’t finished worse than 26th (Kansas). If you aren’t currently following Robby or Reaume Brother’s Racing on their social media channels and would like to I’ve provided the information below.